Perhaps this is a larger box than necessary, but there is a lot packed into this small game. About a year ago, when my love for hobby board games was rekindled, I had some birthday money, and I thought I would try a new game. I pored over reviews, and my choice came down to two games: Puerto Rico and Bohnanza. I thought Puerto Rico was a better bet in terms of which game I would prefer…but I also doubted I could find anyone to play with me since the rules looked more complicated and it couldn’t regularly be played over a lunch hour. Bohnanza looked stupid, but the Amazon customer reviews were glowing, and I also thought I had a better chance of finding other players, so I chose in favor of it. When the game arrived in the mail and I examined the simple, cartoony cards, I thought I had made a huge mistake. 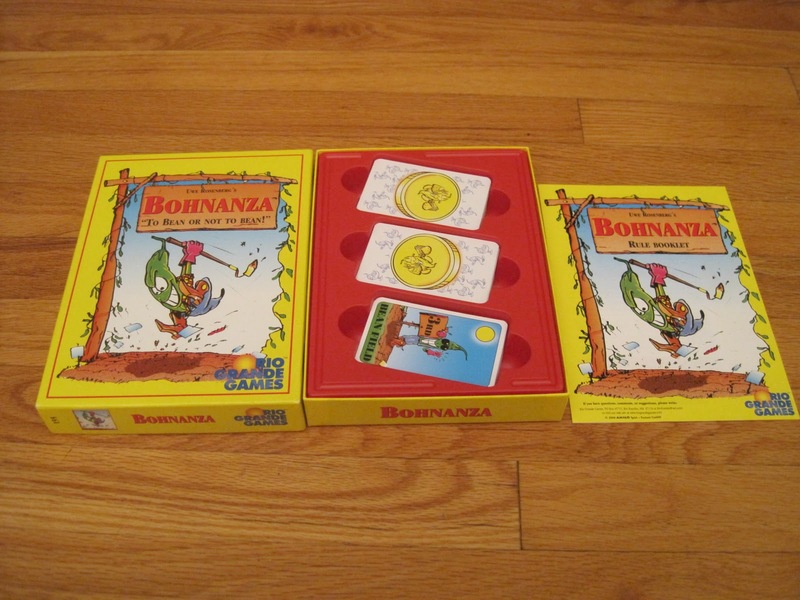 Bohnanza, as far as I can tell, is a play on the German word for “bean” (bohne) and bonanza. (The game is German; they’re allowed to do this sort of thing.) The game allows for two to seven players, but the two-player game is much different from the seven-player game. Both are fun; they’re just different. The premise of the game is that you are a bean farmer trying to raise money through planting and harvesting beans. The goal of the game is to end the game with the most coins. The way to get coins is through shrewd trading, clever planting, and timely harvesting (at least in the 3-7 player range). A harvest of four coffee beans yields one coin. 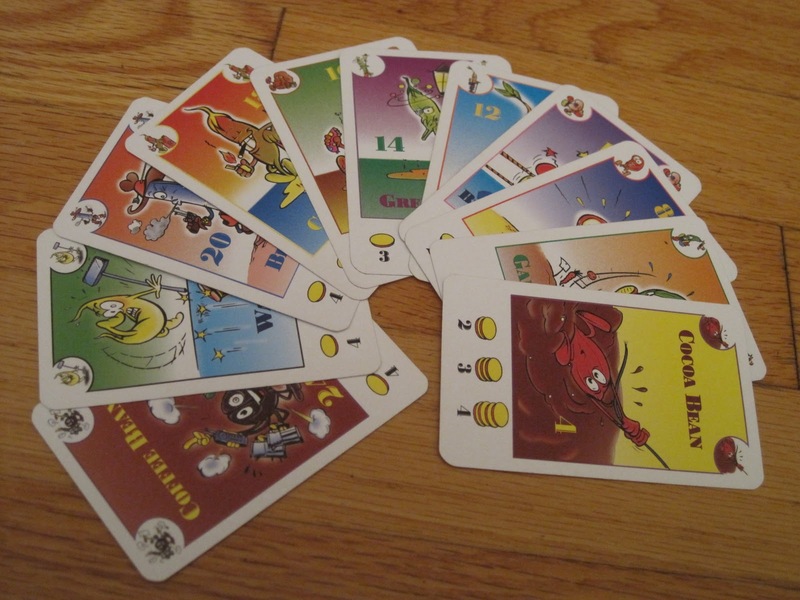 There are eleven types of beans in the game, ranging in scarcity from four beans in the deck to twenty-four beans in the deck. Scarcer beans yield more coins per bean than more plentiful beans, but they may also be harder to collect. (There are twenty-four coffee beans, for example. 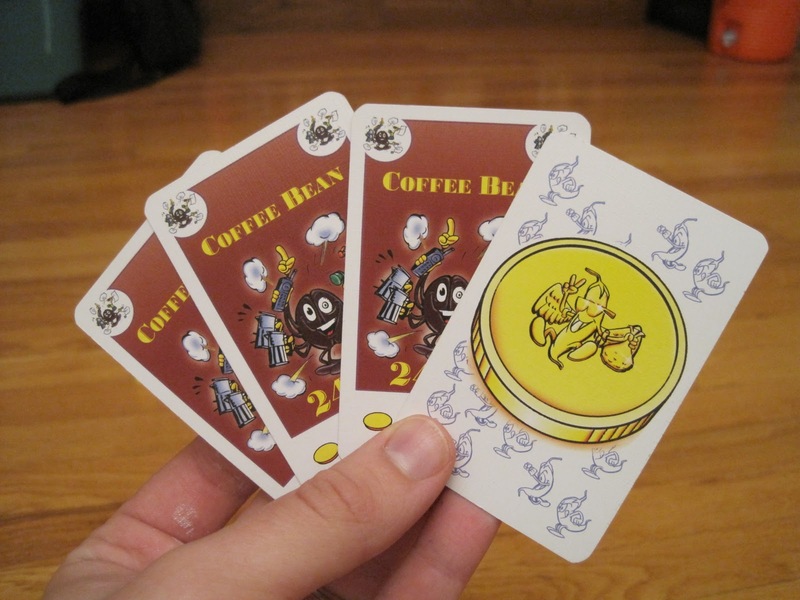 A player must harvest four coffee beans to get a single coin. In contrast, there are eight red beans in the deck. A player must harvest two red beans to get a coin.) 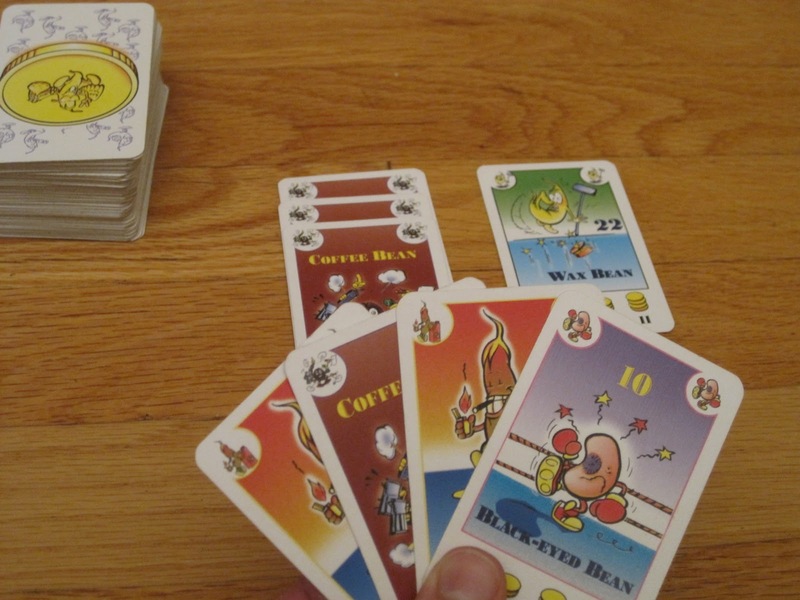 Each bean card has a “bean-o-meter” on the bottom of the card that tells how many beans must be harvested to collect 1-4 coins. You get greater bean-to-coin ratios if you harvest larger numbers of beans. The tricky part of Bohnanza is that your hand order is fixed—that is, you can’t reorganize your hand. Your first card is your first card, your second is second, and so on. On every turn, you must plant the first bean in your hand. You have a limited number of fields, and only one kind of bean can be planted in each field, so if the first bean in your hand doesn’t match any beans in your fields, you must harvest one of your fields. Depending on the number of beans in the field, you may be harvesting prematurely, resulting in fewer (or no) coins, or you may be destroying your chance at a large harvest. So it is to your benefit to trade with (or even donate to) other players to make your hand order ideal for when it’s your turn. You also draw and reveal two cards on your turn, which you must plant if you can’t trade them away. Did I mention that the game encourages you to trade with your fellow players? If this is your hand and those are your fields, you might want to get rid of a black-eyed bean (and maybe a chili bean) stat! My wife and I had played several two-player games of Bohnanza before taking it to my family Thanksgiving and trying the larger game. It took a while to explain (longer than I expected, since the premise and rules are so simple), and the first game dragged a bit as the players tried to figure out the strategy. I was initially afraid that my family would lose trust in my judgment, but about halfway through the first game, as lightbulbs came on, the players were enjoying themselves—so much, in fact, that we turned around and played another game immediately after the first one ended. We played more the next day, and I was commanded to bring it to our Christmas celebration, even though by that time there were more copies circulating in the family. If that’s not a glowing recommendation, I don’t know what is. There is a lot to like about this game. The game reminds me of Pit (one of my favorite party games), but it’s a little more sophisticated. I like the secret trading that happens in Pit, but Bohnanza allows more calculated deals. I like the fixed-hand-order idea and several other safeguards in the game because they help in encouraging trading among the players. Like Settlers of Catan, you won’t get very far in Bohnanza without trading with other players. I like this because it forces interaction. Bohnanza is quieter than Pit—no frenetic deal making here; deal making is a considered process. It’s also fun to sit back and listen to the conversation sometimes because you realize that people are taking their beans very seriously. Lots of bean variety! Eleven kinds in the deck. And so on the haggling goes. The two-player game doesn’t involve trading. The strategy for the two-player variant is much simpler, but it does allow you to play while doing other things and is still diverting. If you’re looking for a good game with a fun concept, simple rules, moderate strategy, and lots of player interaction (and a game that can be played with two players and also with up to seven—though really, buy it for its larger-game potential), Bohnanza could be the game for you. It got rave reviews in my family, and it’s fun to boot. Previous ArticleFDQ: What Is Your Gaming Pet Peeve?